Colombia's biggest rebel group has ruled out peace talks as long as President Alvaro Uribe is in power. But the Revolutionary Armed Forces of Colombia (Farc) said it would be ready to begin the "titanic task" of building peace with a new government. 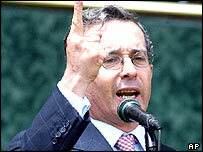 Mr Uribe, whose term ends in 2006, enjoys popular support for his tough stance against rebel groups. He is trying to push through a constitutional amendment that would allow him to seek a second term. Later on Tuesday, the president is due to set out his policies for the year ahead in a speech marking Colombia's independence day. In a statement on its website, Farc again rejected the possibility of negotiations with the Uribe government. "We're ready to undertake, with a new administration, the titanic task of building peace with social justice," it said. The rebels also said the Colombian government could not defeat them. "For a long time, President Uribe has tried to sell the illusion of the military defeating the guerrillas," their communique said. A major offensive known as Plan Patriot, which pursues the guerrillas deep into their jungle strongholds, was destined for inevitable failure, according to Farc. Colombian military leaders say the rebels, who have about 16,000 fighters, will be forced to negotiate within a couple of years. 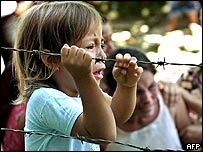 The Colombian government recently began talks with another group caught up in the long-running civil war, the right-wing United Self-Defence Forces (AUC) that opposes the rebels. Last month, the government offered to halt offensive operations against the country's second-largest rebel group, the National Liberation Army (ELN), if it called a ceasefire.